(NewsUSA) - Caterers, event halls and wedding planners are gearing up for fall wedding season, one of the busiest times of the year for hopeful couples. Fall guarantees exquisite photo opportunities without the heat of summer -- and the wealth of in-season decorations are beautiful and affordable. In fact, September and October are the most popular and third most popular months for weddings, respectively. 1. Keep warm. Since outdoor fall weddings have the potential to get chilly, keeping your guests warm is a must. Offer hot cocoa and homey baskets of soft blankets or cozy shawls. Set up fire pits or outdoor heating stations where guests can shake of the chill. 2. Location, location, location. Select a locale that is known for its fall scenery. For example, as much as it's known for history, Valley Forge and Montgomery County, Pa. is celebrated for its brilliant autumnal hues and stunning landscape -- a picture-perfect place for memorable fall nuptials in a historic area of southeastern Pennsylvania. Named among the top 10 national parks for fall foliage, the 3,500-acreValley Forge National Historical Park offers a perfect fall backdrop. Learn more at www.valleyforge.org. 3. Incorporate fall colors into the wedding party wardrobe. Chocolate brown compliments a variety of fall color schemes, and it's flattering for most women. But if brown doesn't suit the plans, burgundy is another great fall shade that makes the bridal white pop. 4. Select in-season flowers and decorations. Unless the bride has her heart set on lily of the valley or orchids, there are beautiful in-season flowers to choose from. Dahlias, chrysanthemums, asters, roses, zinnias and sunflowers all create elegant bouquets and floral displays with a lovely hint of fall. Add some crab apples for a playful, non-floral element. 5. Mix and match gourds, pumpkins and squash. Pumpkins can be tacky or a little too reminiscent of Halloween, so class them up by serving pumpkin soup, pumpkin cocktails or tiers of mini pumpkins. Gourds also make eye-catching vases, and all three can be arranged as charming centerpieces. 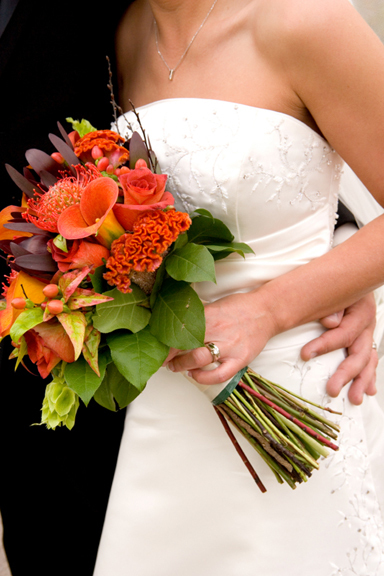 In-season flowers make striking bouquets for fall weddings.